Former Athletes Premier International client and current Hendricks Sports Management client, Aroldis Chapman, threw a bullpen session last Wednesday in Houston. Fifteen teams attended. The teams in attendance were the Astros, Marlins, Angels, Nationals, Yankees, Red Sox, Orioles, Pirates, Reds, Royals, Phillies, Cubs, Mariners, Rangers, and Mets. Chapman threw two five minute sessions, throwing mainly in the 92-93 mph range. The session clearly impressed the Marlins. They offered him a five year deal worth $13 million. The Red Sox reportedly offered Chapman three years and $15.5 million; however this offer was made before Chapman switched agents. His agents have also had recent talks with the Orioles organization. 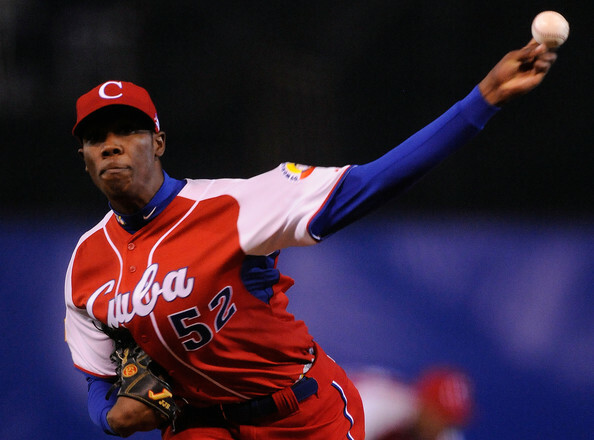 The 21-year old Cuban left-hander can hit 100 m.p.h. on the radar gun and has thrown as high as 102 mph. In addition to the reportedly interested teams above, it is hard to imagine that any team wouldn’t want this guy. However, several questions surround this young, talented pitcher. The first is what type of pitcher will he be? Many clubs question whether he will be M.L.B. ready next year. Another big question surrounding Chapman is how much money will he command given the fact that he has yet to throw a pitch in the United States. An anonymous MLB executive felt Chapman would get a deal similar to the 4-year $15.1 million deal the National’s Stephen Strasburg signed. Another suggested the deal could go as high as $30 million. It appears that Chapman may at least get the kind of money Strasburg received. In my mind, that amount of money would automatically cut the Reds, Pirates and Royals out of consideration. They are probably too small to commit that kind of money to an unproven kid. I would have thrown the Marlins in there as well. However, they may try to lure Chapman to South Florida for less money should he want to remain close to his native Cuba (although I do not think they will seriously remain contenders). The Phillies also do not seem be in contention to sign Chapman, as he likely will command more money than the club can commit after their offseason deals and strict $140 million payroll. The Nationals are also unlikely to offer that kind of money, now that they have signed Jason Marquis and are actively pursuing Matt Capps. The Orioles also recently signed left handed reliever Mike Gonzalez for two years and $12 million. The signing likely makes Chapman unaffordable to them as well. In addition, the Mariners have made several moves so far that likely put Chapman out of their league. That leaves the normal big market clubs (Yankees, Red Sox, Mets, Angels and Cubs) as well as the Rangers and Astros. Out of these clubs, it is unlikely the Yankees will be willing to spend the amount that Chapman will command, with them looking to curb spending this year and still seeking a starter to add to their rotation. I believe that the Red Sox, Angels, Mets and Cubs could afford him. The Red Sox may win the Chapman sweepstakes if no other team is willing to beat their offer. While it is completely up to Chapman where he goes, and he seems to have his choice of destinations, I believe that the Angels seem like the perfect choice. They are looking to make an offseason deal to counter those made by rival Seattle as well as to keep pace with Boston. They also appear to have the funds necessary to make such a deal. The questions would then remain as to whether the Angels want to take a chance on Chapman and whether Chapman would be willing to move to the West Coast.